Voice Academy is a studio dedicated to training all types of singers, from beginners to professionals. Our team of coaches work to create a comfortable learning environment and community atmosphere for singers of all ages. Voice Academy provides individualized lessons to strengthen vocal ability, build range and help you discover the voice you've been dreaming of. Singing lessons are just one of the many things we offer to our singers. At Voice Academy, we provide several performance opportunities, full production concerts, open mics, songwriting & professional recording services. The owners of Voice Academy have over 20 years of combined experience in music. From studying classical music theory and application, to working with industry coaches and artists from around the world and being on reality singing TV shows. We strive to build your voice, confidence and passion to find your inner artist! "If you're looking for somewhere to take singing lessons, this is the place to go!! Not only is this studio professional but it's also fun and makes people of all ages excited to learn to sing. The coaches are completely invested in their students and always give 110%." – Sierra S.
Cassie is a seasoned singer, performer and vocal coach. She has been singing/performing for the last 16 years and has studied under some of the most sought after voice instructors in the industry. Having been on multiple TV singing competitions, Cassie has the experience and knowledge of what it takes to be in the music industry. With backgrounds in classical training and modern day cutting edge techniques, she has a passion for teaching all genres of music and has spent the last 6 years training kids, teens and adults. Sara Solomon has 8 years of experience teaching voice in Northern California. With a strong background in Music Therapy and Music Theory, Sara is comfortable working with singers of all experience levels, musical styles and ages. Sara uses safe, effective techniques to improve tone, range and agility while maintaining vocal health. Shea is a singer-songwriter, musician, and performer. She has been professionally performing in the Sacramento area for the last 10 years and teaching guitar, ukulele and voice for the past 7. Shea is knowledgeable, passionate, fun and charismatic. Using the latest techniques, she caters every lesson to the students specific and unique musical goals. Whether it is a hobby or a lifelong dream, Shea will give you the skills you need to play and sing the songs you love. 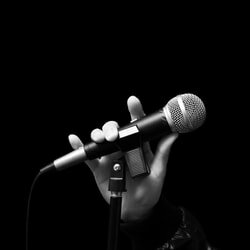 Daniel Jackson has spent the last 16 years studying voice under the top vocal coaches from all over the world learning the most effective and cutting edge vocal techniques ever developed! Using these techniques and his experience Daniel has trained thousands of singers voices and developed a revolutionary teaching approach based upon vocal technique, style technique, and emotional expression. ​Daniel’s resume includes accolades such as Vocal Education Director, Certified Senior Instructor, Vocal School Co-founder, Education Advisory Group Member, International Teachers of Mix Accredited Teacher, National Association of Teachers of Singing Member, Certified Speech Level Singing Instructor, Physiological Voice Pedagogy Teacher, and Voiceworks Associate. Juliet has been professionally singing since she was 8 years old and hasn’t lost her passion since. With prior experience in choir, theater and voice lessons, she has gained the knowledge not only of vocals, but stage performance skills. She has even put her skills to the test in 2013 when she was featured on X Factor USA with her vocal group Paradise! Juliet has a passion for teaching and her number one priority for her students is to have fun and grow while learning. In using vocal warm ups that are custom to each students voice, she wants to help young children find their love of music and boost their confidence for singing!